This is my third hack I have made. Like my other hacks this one was made for a contest--Post Hack Scrubs Contest. However, this is not the version posted for the Post Hack Scrubs Contest. This version has a few fixes that were made too late for the contest. If you want to play the contest version go to the Post Hack Scrubs Contest forum page. This is a non-linear hack with many different routes to take. There are a few patches applied to this hack. The most important of these is re-spin. No advanced techniques are required to beat this hack. At some point in galactic history a powerful company purchased a beautiful plot in space. They used this plot to build The Space Grand Resort and Spa. However, there was one tiny, maybe large issue. There was a space junkyard(?) within view of the resort, and ruined the view. How were customers going to enjoy their stay at the resort with such a hideous view (that the owners of the resort somehow did not notice while the resort was being built). The answer was simple. Buyout the space junkyard(?) and have it cleaned up (blown up). The resort sent out men to try doing just this, but a mysterious force was keeping of the timebombs from going off. The company was at a loss as how to clean up (destroy) the junkyard. That is, until an intern of the janitor spoke up during a meeting, "I have heard tales of a bounty hunter that blows up almost every planet she visits doing her job." 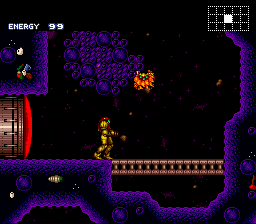 Because of this intern Samus received a very simple job--clean up (blow up) the space junkyard(? ), and find out why the other timebombs were not blowing up. Overall a very good hack with some small issues. There was one room that stopped scrollingat a certain point, and I confused the game once because I entered a screen transition while the screen was still scrolling. 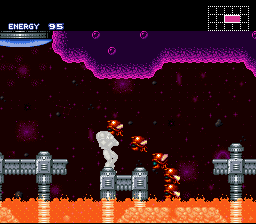 Also the Missile refill right before Crocomire doesn't work. And don't spacejump up at the landingsite, once I hit the ceiling, I was teleported into another room somewhere out of bounds. Very fun to play, some places where you can sequence break, I really enjoyed exploring the quite small but open environment. Finished with an IGT of 1:19 and an item percentage of 91.1%, didn't find any animals to save. Note: This review is based of the contest version. Any bugs I have seen have likely been fixed in this version, so I did not mention them and thus did not effect my rating. This was probably the best hack from the "Post Hack Scrubs" contest. It is also the largest. Crystal_Knight never fails to deliver a solid and enjoyable hack. The hack is very open ended in nature, which unfortunately leads to a lot of backtracking. This didn't bother me personally, (it is a metroid game after all) but I can see others getting slightly annoyed by that. Difficulty was much more balanced than his past hacks. He made ammo actually useful at the cost of beams being very weak. 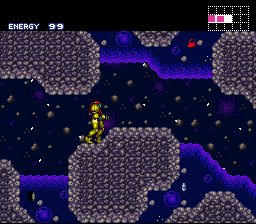 This is sightly annoying early game though, as enemies take very many shots to kill with any beam type. Lastly, the hack is aesthetically pleasing and fits the contest theme well. Well done. This is a nice little way to spend a pleasant hour cleaning up the universe of garbage. The biggest flaw with it is there isn't really much of a direction for the player. You can get places and find things, but there is basically one spot to get certain things, and it isn't always easy to find out. Otherwise this is a fun, and definitely recommended, hack that is full of bubbles and junk.